Yoga lovers agree that the Active Paisley Yoga Mat is the best for beginner and intermediate yogis. This extra thick non-slip yoga mat is 50% thicker than our competitors', yet the non-slip surface prevents injuries and stays sturdy even during difficult poses. Plus, you'll love the convenient strap that allows you to toss your mat under your arm as you head to your class. The double sided texture gives you the freedom to customize your experience. One side reduces slipping, and the other gives you extra cushion, so you are free to choose how to enjoy the world's perfect mat. Even after years of sun salutations, vinyasas, and chair poses, you will still be proud to show off this mat. You'll be the envy of the studio while you connect with your inner self on the world's most comfortable yoga mat. 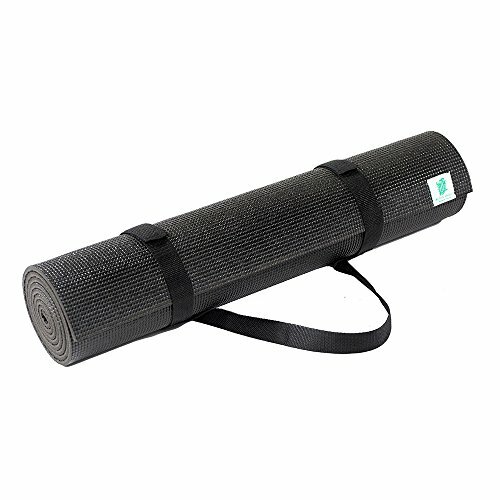 Most importantly, this yoga mat is environmentally friendly, SGS approved, and free of all latex and metals, so you can express yourself while still being good to the earth. THICK MEMORY FOAM: We Created A Mat Thickness of 1/4". With The Mat At 1/4" This Will Provide An Ideal Foam Thickness That Provides Comfort and Support Without Feeling Bulky Or Overly Dense, So Your Knees Stay Healthy And Injury Free. TWO SIDED SURFACE: One Side Has A Non Slip Surface That Grips The Floor, And The Other Has Extra Cushion To Protect Your Joints, Increase Flexibility, Relieve Stress, and Improve Overall Fitness On The Most Comfortable Memory Foam Mat That You've Ever Used. ENVIRONMENTALLY FRIENDLY: The Active Paisley Non-Slip Yoga Mat is SGS Approved, And Free Of Latex and Metals. It Is Also Free Of Rubber, So You Won't Stink Up The Studio! OVER-THE-SHOULDER CARRYING STRAP: Makes Taking Your Yoga Mat Convenient While You're On The Go. Happy Yogis Agree That The Active Paisley Yoga Mat Is The Best That They've Ever Used. 100% MONEY BACK GUARANTEE: If, For Whatever Reason, You Don't Absolutely Love Your Active Paisley Yoga Mat, Just Return It, And We'll Refund You Every Penny! If you have any questions about this product by Active Paisley, contact us by completing and submitting the form below. If you are looking for a specif part number, please include it with your message.